A diamond's crown encompasses everything that sits above the girdle. Similar to the diamond table, refracted light passes down through the crown, and is then reflected back up from the pavilion into the observer's eyes. The various facets disperse light in different directions, resulting in a colorful, stunning fire. 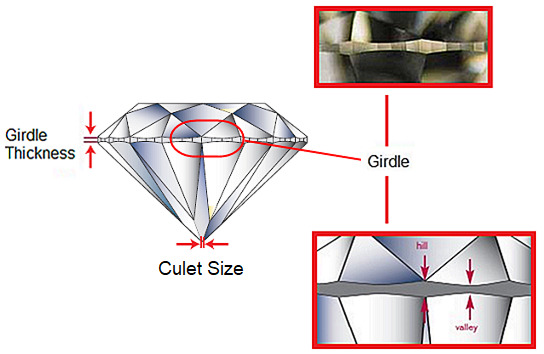 The culet (pronounced cue-let) is the very bottom of a diamond's pavilion. It is either a point or a tiny facet that lies parallel with the table (i.e. the top of the diamond). If a facet, it can be polished or left unpolished. 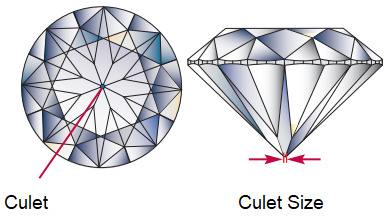 If a culet is larger than average, it may affect the overall appearance of the diamond: When looking down through the table at the diamond, as when set in an engagement ring, a large culet may be visible. A large culet allows a greater amount of light to escape through the bottom of the diamond, rather than reflecting it back to the observer's eyes, resulting in a noticeable dark circle. Diamonds with small culets are likely to exhibit the most brilliance. Any diamond culet size of Medium or smaller will be invisible to the naked eye, and have no negative impact on a diamond's appearance. However, if a culet is Slightly Large or larger, it may allow light entering from the crown to pass straight through the culet facet, reducing the diamond's brilliance. This may also make the culet appear as an inclusion, or create a dead area on the diamond where the light is escaping through the bottom. The girdle is the widest part of a diamond: the outermost edge where the crown and pavilion connect. When placed in a halo or bezel engagement ring setting, the girdle is typically hidden and level with the metal as it meets the diamond. In a prong or channel set engagement ring, the girdle can be seen where no metal touches the diamond. Gemologists consider a diamond's girdle width when assigning a cut grade. If the girdle is too thin or too thick, they will only assign a Very Good or Good cut grade to diamonds even if they have plenty of sparkle and structural stability. A girdle may be faceted (a series of tiny polished sides going around the diamond), bruted (a single continuous unpolished surface going round the diamond; no longer common), or polished (a bruted girdle that has been polished smooth). Whether a girdle is faceted, bruted, or polished usually has no impact on the appearance or value of the diamond. A thick girdle (right) adds weight to a diamond. The diamond on the right is heavier, yet will appear no larger when set in a ring. The underside of a diamond extending from the girdle down to the culet. The bulk of a diamond's weight is typically held in its pavilion. This means it is often considered the most valuable part of the diamond and yet its angles are more important than its size. It is critical for a diamond's pavilion to be neither too deep or nor shallow. An overly deep pavilion brings a darkened effect to the diamond, since it does not reflect enough light back up to the observer's eye through the crown. A shallow pavilion creates a 'fish eye' effect if viewed from the table, caused by the girdle reflecting in the middle of the table, appearing dull and lacking in scintillation. The optimal pavilion angle is between 42.5% and 43.5%. The table is the flat, topmost surface of a diamond. It is the largest facet, regardless of the diamond's shape. A diamond's table refracts light rays downward as they enter the diamond. In turn, that light is reflected back up from the pavilion and through the table, thus, most of a diamond's light reaches an observer's eye through the table. The size of the table impacts the amount of light that can enter the diamond. It is therefore an important factor gemologists use when assigning a diamond a cut grade. 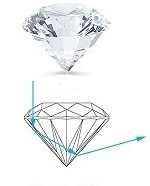 When a gemologist grades a diamond, he/she measures its proportions and then calculates five ratios: depth percentage, table percentage, crown angle and pavilion angle. These ratios help to determine the diamond's cut grade, and are included on its grading report. The depth is the total height of a diamond as measured from the table to the culet. The diameter is the Width of a polished stone that is measured from edge to edge. 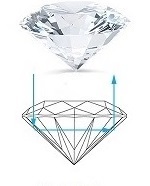 The depth percentage is one of the key factors in determining a diamond's grade of cut. 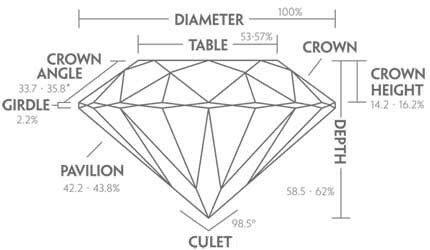 Depth percentage is expressed as a ratio of the distance between the table to the culet and the diameter of the diamond measured across the girdle. 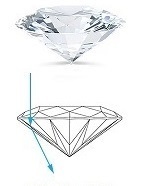 Depth should measure 54% to 66% of the diamond's diameter in order to optimize sparkle. Diamonds with a cut grade of Very Good and Ideal have a depth percentage within this range. Table percentage is all about balancing the width of the table and the diameter of the diamond to produce optimal sparkle. If the width of the table is too large or small compared to the diameter of the diamond, the top of the diamond will appear flat or rounded, and either way sparkle is compromised. The ideal table percentage falls within the range of 53% to 70%. If the crown angle is too large, sparkle will be limited when viewed from above. If the crown angle is too small, the top of the diamond could appear clear and glassy. Diamonds cut with an optimal angle will yield more sparkle. 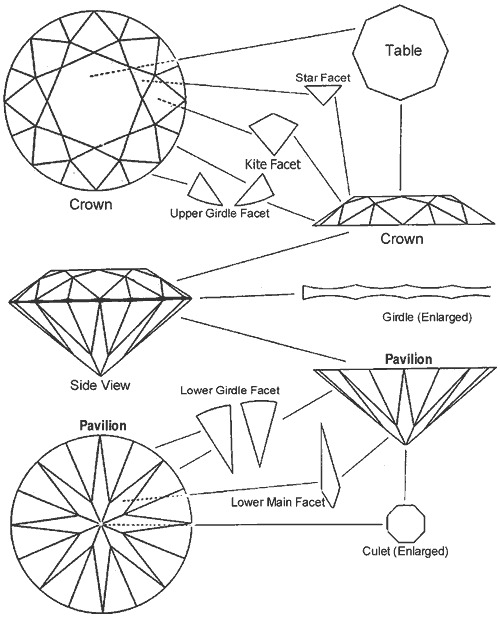 Most round diamonds have a crown angle between 30% and 35%. 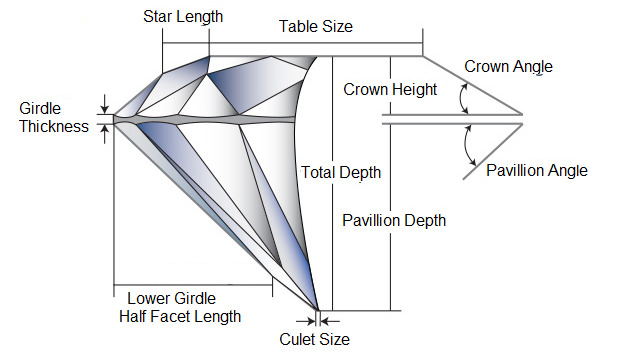 The crown angle for a round Ideal cut diamond must be between 33.7% and 35.8%. As with the crown angle, if the pavilion angle is too large, it will not emit notable sparkle. If it is too shallow, the diamond could appear glassy. When cut for brilliance, the pavilion will reflect the most sparkle to your eye through the top of the diamond. The optimal pavilion angle is within the range of 42.5% to 43.5%. Depth percentage too shallow: 53% and below. Crown and pavilion angles too shallow. Depth percentage is ideal for maximum sparkle: 54-66%. Crown and pavilion angles are optimal. Depth percentage too deep: 67% and above. Crown and pavilion angles too large. Note: the percentages above are specific to a round shaped diamond. The ideal proportions for other diamond shapes are all slightly different. Facet: A surface or 'face' created when the diamond is cut. Star Facets: Triangular shaped facets surrounding the table which form a star-shape when viewed from above. Kite Facets: Facets shaped like a four-sided kite which extend from the table to the girdle. Sometimes referred to as Bezel Facets. Upper Girdle Facets: The 16 triangular facets that sit directly on top of the girdle. Lower Girdle Facets: The 16 triangular facets that sit directly below the girdle. Pavilion Main Facets: The 8 large four-sided facets which run from the girdle to the culet.